In recent months we've seen Nintendo — both in Europe and North America — offer the incentive of a free game for those registering a 3DS XL. Nintendo of Europe is now stepping up with an enticing new offer featuring a list of eight retail games (both current and to be released); it's very simple, if you register three of the eight games on your Club Nintendo account, you can pick any of the other eight as a free download code from the eShop. The eight games in the promotion are below. That's a rather terrific list of games and, to repeat, to get one free you have to register three from the list on your Club Nintendo account. Half of these games are yet to be released in Europe at the time of writing, and the first codes can only be claimed from 2pm UK time / 3pm Central Europe on 23rd April. Registration of games that are eligible must be completed by 11:59 on 30th June, while code claims for a free game must be made by 11:59 on 31st July. As with previous promotions, if your account has three eligible games registered, a promotional banner will appear at the top of the My Account page when you're logged in; you then select your game and will be emailed a code right away or, if it's yet to be released, shortly after it hits stores. As the code is emailed, the free game can be downloaded — just once, of course — on any 3DS device. Listed games already registered before now will be eligible for the promotion. With some serious big-hitters on the list, especially Animal Crossing: New Leaf, this is an exciting offer. We recommend checking out the official "So Many Games!" website for all of the details, and we'll be keeping an eye out for any equivalent promotions in North America. So, European 3DS owners, how many of you are going to take up this offer? That's an amazing promo! Hope it comes to North America. I'm all set. Will register them tomorrow and wait for my digital copy of Animal Crossing! I have Fire Emblem, and I'd like Animal Crossing and maybe Luigi's Mansion. Unfortunately, I haven't really got my eye on any of the other games on the list, so, at the moment, I can't really justify spending £60+ on games for a free one. Good deal. Would be cool if WE got hat in the states. Very nice! I have Luigi's Mansion and Fire Emblem, and will definitely be getting Animal Crossing. I might buy Donkey Kong since its only £26 on ShopTo, and then get a download of AC for free. Couldn't have finally become an XL owner at a better time. I already bought LM2 and MH3U plus two other games with my own money, so that leaves either AC:NL, DKCR:3D or FE:A as my interesting choices. Personally, I'm willing to spend money on all three at any point in time but I've been dying for Animal Crossing in particular for a long time now. I think I'm happy to claim that as my free bonus. The rest can wait because OMG FREE ANIMAL CROSSING. Oh gosh, BRING THIS OFFER TO AMERICA!!!!!! Hope it comes to America. I've got LMDM which I've not registered yet, and I'll probably get a couple 3DS games for my birthday so I'd love to take advantage of this if it comes over here. Now, if I was lucky enough to win that Castlevania: Lords of Shadow competition, then I can buy Luigi's Mansion 2, and then claim my free Animal Crossing: New Leaf. But that's highly unlikely... I'm right in thinking that Nintendolife hasn't declared the winners of that competition, aren't I? Amazing, that's my Animal Crossing pre order cancelled then, I was actually debating whether or not to pay £10 extra just to have it installed on my 3DS. I have Luigi's Mansion 2 and plan to buy Fire Emblem, so i'll see what is the cheapest at the time when Animal Crossing comes out and buy that. Does it have to be 3 different games? in my house there are 2 copies of LMDM. What a cunning plan to get us to buy your games. Haven't got any of the games yet. Want: Luigi's Mansion 2 and Animal Crossing. Not so sure about the others, although each are great games. I already have Fire Emblem: Awakening. I'm going to get Animal Crossing: New Leaf, Luigi's Mansion 2 and Pokémon Mystery Dunegon: Gates to Infinity at one point or another. Guess I'll get one of them for free. @Dambuster: Yes, since you can't register same game twice on Club Nintendo. I've tried before, couldn't register my brother's Mystery Dungeon: Explorers of Sky since I had registered mine already. EDIT: Looks like I'm wrong. Take a look at rjejr's post below. Thanks Nintendo! Now if you would release a European special mii as well I'd love you forever. I think I can see how this will pan out for me. I already have Luigi's Mansion Dark Moon and loved it. I need to try out the Fire Emblem demo still. If I like it, I might actually buy that. Pokémon Mystery Dungeon is an absolute purchase for me. With those three games, I will be eligible to get the Animal Crossing download code when it launches in Europe, awesome. 1 game too many for me. I already own FE, so only needing 2 would've got me to buy LM and take AC or DKC as the freebie (since my interest in those are low). Don't care about the rest. @Doma I bet you'd love ACNL (Or just Animal Crossing in general). And DKCR is about as good as any platformer gets (that is if you want a really really hard platformer though DKCR 3D will have an easy mode as well). They should actually be tied to your Club Nintendo account automatically - assuming your country has access. @Vallu If you've linked you're 3DS account to your Club Nintendo account, you still get them registered. As long as you fill in the survey online. Looks like a free game for me! Already have Luigi's Mansion and I'm planning to get Donkey Kong on release (never had the Wii version). I was interested in Castlevania: Lords of Shadow - Mirror of Fate but was going to wait for a price drop. This promotion has pushed to consider getting it sooner now. And this in turn will allow a free download for Animal Crossing which I wasn't too sure was for me, but I'm willing to try it for free! @rjejr: I never noticed that option. I'll take a look at that when I register other games I have not yet registered. It's pretty weird timing. I understood the free game on January as the 3DS needed a boost, but lots of these games would have sold well without the offer. Instead of getting £39.99 off me for a download of AC, they'll now get a portion of the £26.86 I'm spending on an Animal Crossing download AND a physical copy of Donkey Kong. That £26.86 also gets split between Nintendo, the retailer, manufacture and distribution etc. @Peach64 They're probably hoping people will go out and actually buy two or even all three games just to get the free one. 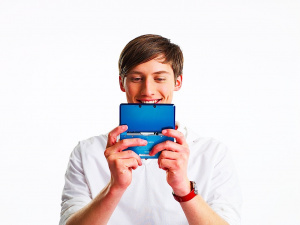 It might even entice newcomers to buy a 3DS along with three of the games. If they can advertise this well enough, it could be great business for them. So i already registered luigi, vania and fire emblem when they came out does that mean i'm eligible? I'm going to be eligible (I'm getting Fire Emblem, Luigi's Mansion and Animal Crossing), but I'm still not sure what my fourth game will be. I already have DKCR on the Wii, I've finished Mirror of Fate but it wasn't my own copy (so no registering), and I don't like the Lego games. That leaves MH3, which I've tried on the Wii but haven't really got into, and Pokemon Mystery Dungeon. I guess I should give MH3 another chance. One thing's for sure, Animal Crossing is going to be the downloadable one. Got Luigi and am going to get Fire Emblem. I BADLY want Animal Crossing as well, but since it's the only retail game I've ever wanted to download, I'll let it be my freebie. Not sure what other game to get since they don't interest me too much on the whole...Donkey Kong comes the closest. Might spread the word about this a lot where I am. I know lots of people that got Luigi's Mansion, Fire Emblem and are looking at Mystery Dungeon, but aren't on the Club Nintendo thing. A free retail game, especially out of this lot and with downloadable Animal Crossing being one of the options, is surely worth registering for. There are really only 3 games on that list I want (Fire Emblem, Luigi's Mansion 2 and Animal Crossing) but with this promo I will have to pick up another game. I was planing on getting AC as a downloaded game anyway so this is good news for me. I think I will get Donkey Kong Country: Returns since I missed it for the Wii (was far too expensive for me to get it). EDIT: Might put a reminder on my phone so I don't forget this. For anyone who hasn't played DKCR yet, it's a great choice. It's very fun, challenging and well designed; I liked it better than NSMBW. A good deal except for the part about the free game being a digital purchase since I am only interested in these as retail physical copies. I was planning on buying an XL anyway. I have Luigi and Fire Emblem and will buy Animal Crossing. I think I'll go for Monster Hunter. Sweet deal. Awesome promo - gonna get me some free Castlevania, yay! @edhe That competition is long over (I know because I was one of the runner-up poster winners). I found it a bit odd that they didn't make an announcement for it as well. Anyway, this is a great promotion! Already have Fire Emblem, I'm planning on getting Luigi's Mansion 2, but I don't know what to pick for my third game and my freebie... Probably between Pokemon, Monster Hunter and Donkey Kong. This is one of the best promotions I've ever seen! Nintendo, I hate you for this promotion. I have registered 3 games from the list, but not "after 23 april" ! So, If I don´t buy games before, I will got one for free. What if I bought the AC special edition XL, would that still count? Well, this certainly couldn't have come at a better time, got LM2 and MH3U already registered and there was no way I'm going to skip the DK port so that's a definite free game for me if I won't forget to claim it. The question will be if I either want FE or AC, gonna be a hard choice. Also, @Koapa my friend did the same thing but Nintendo confirmed (I think) that it doesn't matter if you already registered them. @GazPlant - This really is the best promo ever! Well done NoE! Learn to read the terms guys. "To take part in the promotion, simply buy any three of the above games (as a boxed copy at retail, a Download Version from Nintendo eShop on a Nintendo 3DS or Nintendo 3DS XL linked to your Club Nintendo account or as part of a Nintendo 3DS / Nintendo 3DS XL bundle pack)"
@Koapa: You'll still get the free game. "To qualify for this promotion, any three of the eight eligible games must be registered since their respective release by 30 June 2013 (23:59)." I will get a free game?! Great! Thank you guys, you made me a better day. And this one, was one of the worst ever. I'll buy Luigi, Fire Emblem and Castlevania soon. I don't want Pokemon Mystery Dungeon neither Animal Crossing. That leaves me with Monster Hunter, DK and Lego. Since Lego is not what I hoped and I already have DK and MHTri for Wii...I'll get Ultimate because of all the new stuff. Oh man please come to NA. I already got 3 of the games listed.. I will decide after trying the Pokemon Mystery dungeon demo. But I see it to Donkey Kong. Just been to blockbuster, rented 2 of the titles, both had unused code in box. Now that is a deal. Cool! I'll get Luigi Mansion 2, Fire Emblem and Donkey Kong Country Returns and I'll get Animal crossing for free! Okay, I swear I won't complain anymore about the weak star catalogue, these promotions are so amazing! gotta love that club nintendo isn't in denmark. Nooooooooo! I bought and downloaded luigis mansion 2 AND fire emblem on Friday 19th does this mean if I can't get a third to get a free game??????? Daaang, I hope this comes to America. I'd totes pick up LM2 or DKCR (I've got MH3U and FE) and get me some free Animal Crossing. I'm glad I waited to buy Luigi's Mansion 2 and Castlevania. I'll probably also get Donkey Kong Country Returns. Now the question is which free game shall I go for? Monster Hunter, Pokemon or Fire Emblem? Choices, choices. Doesn't matter when you bought or registered the eligible games so long as you've registered them before June 30th. The 23rd of April is the date when you can start claiming your FREE game. Oh god...i cant decide...i really like havong boxed copys of my games, but who could turn down a free game ? And i already got plenty of games from the list (Monster Hunter, Luigis Mansion, Fire Emblem, Castlevania). I guess the wisest thing would be to wait for Animal Crossing, to have it around at all times. Just bought FE:A yesterday, I'm getting MH3U for my birthday tomorrow and I was allready planning on DKCR3D in the summer! Free AC HERE I COME! I have Luigi's Mansion 2, Fire Emblem: Awakening and LEGO City Undercover. YAY FREE GAME... Now, which to get? Hmmm. If anyone's interested in that, you can ask for a download version of a game you've already registered. I know it's a special case, but that's what I'm doing (I'm going to give a copy of AC to my sister). It says so in the FAQ. I really hope they bring this to America. I'd love a free copy of Fire Emblem. I just worked out if I spread the cost of my 3DS console and all my games out, then I've paid less than RRP of my games come to. I have 7 games, and the RRP is £39.99, that's £279.93, but I've only spent £255.84 on 7 games AND a 3DS XL. @MeowtOfHere Well if your get it before 30th of June (or regester it) because if your B-day is 19th of July and you get the game that day, then you won't be able to get your free game. Gotta love living in an European country with no Club Nintendo. Actually now that I think about it, I might not get Animal Crossing digitally because that would be the most prized game on my 3DS. If anything, my 3DS would get broken someday or even stolen and I can't recover it and I'd have to fork out £40 to get a physical copy. However, it's still the title that I'm eagerly wanting to play on my 3DS (and the reason I bought a 3DS too) out of the other 5 that I could get for free. @Five-seveN The only AC i've played was GC. From what i can tell, very little has changed about the game since then despite having regular entries. I get why people like the game but, i doubt there'd be much incentive for me to play it without those cool hidden NES gems. It just gets boring after a short while. DKCR is awesome indeed. My low interest is due to owning it already. Wish it was a new game. @Doma Yeah, I wish they'd do a Diddy's Kong Quest Returns. DKC 2 was the best one in my opinion. About AC though, I haven't played the GC version so I can't speak for it, but Wild World and City Folk were almost identical. This one looks like they've added quite a bit new however. For me anyway, this is perfect. I've purchased Luigi's Mansion 2, will be picking up DKCR 3D with some birthday money, and after playing through the Fire Emblem: Awakening demo, I'm determined to make the game mine by the end of May. This leaves me with the tough decision: Monster Hunter 3 Ultimate, or Animal Crossing: New Leaf? @dudey300 Tough one...I've heard Monster Hunter is pretty good and has a lot of replay value, but personally, I'd get ACNL and get the Wii U version of MH since it probably has better controls via the gamepad and online play (provided you have a Wii U). @Hunter-D Thank Christ for that, thought I'd really missed out for a minute there. You could buy a download code for some of these games on Game's website for £32.99. Save yourself £7 a game them get donkey kong for free!!!! @Five-seveN That is pretty much the reason I am not going too get the 3DS version of the game since I want too get the Wii U version. @Marakuto sure if your 3DS is stolen your insurance would repay the cost of the software installed on it? @Five-seveN That makes more sense in fairness. I have MH3U for the Wii U, so I'd imagine I wouldn't be missing out too much. AC:NL it is! @Peach64 how have you got animal crossing for free? @DESS-M-8 He is saying that he is going too be getting the AC free because of this promotion. If this came to NA, I'd register LMDM, and I'd get ACNL and DKCR 3D both of which are $5 cheaper than most new 3DS games. Then I'd use the free code for Awakening since it's full priced. Strategy! I dont have any games of them but I dont get it You get 3 of any of THOSE games or just any game? Also When is the deadline some one answer!!! Awesome! I already have Luigi's Mansion 2 and Fire Emblem: Awakening, and Animal Crossing is a no-question purchase. Now I just need to decide what to get. We must get this in the effing States. WE MUST. @rayword45 - I'm sure this'll come to the US. Fingers crossed for you dude! I never even Signed up for club Nintendo because I lost my red card which had the pin. Would that make a difference? @rayword45 But you guys already get cheaper games and stuff to actually spend your club points on. Don't be greedy, lol. @Perfectkill You can enter the codes anytime between now and to the 30th of June. @Perfectkill - Register the games up until 30th June, download your free game by end of 31st July. Bring it to America so I can get Donkey Kong!!!! I have two copies of fire emblem. Would registering two fire emblems and one luigis mansion 2 count as three games? Don't count on getting a Club Nintendo code with Castlevania LoS MoF. Despite being listed as a Club Nintendo retail title for NA, Konami didn't bother to include Club Nintendo PIN codes in the Canadian copies, and when I contacted them about it, they didn't even respond. Thanks, Konami, I'll remember not to get trolled by being foolish enough to buy your games again. @Seancy Well it does say you must register 3 out of the 8 eligible titles. Therefore 2X FE & 1 LM is still only 2 games out of the 8. Besides you can't register the same game twice. thx 4 da ansers guys my final question is If I make an account by using Luigi's mansion 2 would I need to buy it again to enter or would it still be ok to use for the.. SO MANY GAMES promotion? @Perfectkill Normally with these promotions they always just had the one game per promotion. So the 8 games shown above will not be used again in another future promotion. @123akis Its not a scam if they have it printed on the website in the legal terms of agreement. I already have two of those games and I have Animal Crossing: New Leaf pre-ordered, so I'd obviously love for NoA to offer us a similar deal. I already have 3 of those games (Castlevania, Luigi's Mansion 2, Fire Emblem) so I'll take a free Monster Hunter 3 download, as I already have the Wii U version and it'll allow me to transfer my game save and play it on the go. I'd much rather have physical copies of the other games I was intending to buy anyway. I will make use of this nicely. Already have Luigi's Mansion and Monster Hunter, and will pick up Fire Emblem soon (stocking shortages right now) and Pokémon soon. Already have Donkey Kong on my Wii, not really interested in Castlevania and Lego City all that much, so my choice goes to Animal Crossing on this one. It's one of the few games I can live with being a digital download instead of a cartridge game. Just bought LM and FEA, and I'm definitely getting Animal Crossing. So now's hoping this comes to NA, I'd most likely claim Monster Hunter if it did. "As the code is emailed, the free game can be downloaded — just once, of course — on any 3DS device"
Excuse me? If I delete the game I cannot get it back? Is that correct? @Matthew94 No, they mean it's tied to your 3DS. You can re-download it. I wish this was in NA. I have both a copy of Luigi's Mansion and Pokemon Mystery Dungeon which I have yet to register and I'm getting Donkey Kong since I didn't play the Wii version. That would've worked out well since Animal Crossing is probably the only 3DS retail title to date that I'd consider downloading. I really hope NOA does this, but I'm not holding my breath. guys i got a normal 3ds and i have not registare it on club nintendo but had made a acount from the eshop would i still be able to get this promotion? @firebowser I wouldn't say if it mattered if your Club Nintendo account was tied too your 3ds (it would if you bought one of the 8 games as a downloaded game). Just register your 3 games to the site and you should get the code anyway. If I am wrong then someone correct me. PLEASE let this come out in the states. I bought MH3U and Luigi's Mansion. I'd break down to buy Castlevania in a heartbeat if it would get me Animal Crossing for free. a local store has a "buy two games, get one free" promotion this week so i can actually get two free games. sweet! I'd love to have Fire Emblem as a download. It will look very nice next to my download of Sacred Stones. The end-date for redemption is mid-July means Nintendo are releasing Donkey Kong and Animal Crossing before then. I think mine will be Animal Crossing as it will be useful keeping it on the system, otherwise I'd be endlessly swapping cartridges! @SilentHunter382 : no worries there, the "buy two, get three" offer is valid for all games on all platforms. That's a nice offer! I'll guess I'll make use of it too! Let's see: I already have Luigi's mansion 2, and Castlevania and Fire emblem are on my list! I guess my free game will be DKC returns 3D! That way I can sample the extra levels for free!! I should get a new SD card though! One with bigger capacity! Its great that Animal Crossing: New Leaf will be a promotional game choice. But its kind of a bad idea to give that away for free when that is the most anticipated game that people are looking forward. It should be taken off the list so people would buy it instead getting it for free to create more profit to Nintendo. Its kind of a bad decision of Nintendo of Europe to give a away a game that hasn't even release, yet a game that will bring profit to Nintendo. Just downloaded castlevania for £32.99 from game as my third game ad bagged a free copy of donkey kong!!! Free digital copy of Donkey Kong Country Returns.?? Has to be one of the best sentences ever. Not only that, I don't have to do anything now, Nintendo will automatically send me the code after release. @SilentHunter382 i am now getting castlevania aswell as fire emblem!!!! Wish Australia was part of Europe our club Nintendo store is a joke. Probably wont get this offer even though we are also PAL region. Least we get special colors normally. I really think Nintendo needs to treat world the same. Obviously Japan will get some stuff different but Europe, US and Australia. Is a bit silly at the moment. I already have 2 games regrestered from the day they came out I have yet to regrester my MH3U 3DS game will I be eligible if I have games regrestered from before the offer started? @AceTrainerBean yes, you will automatically be notified with a banner on your Club Nintendo screen, you just click on it to pick ehat game you want. Picked my game today, but am still waiting on the code from Nintendo. Getting Luigi's Mansion for my little girl as I already own it and I will buy 3 of the other games anyways. So a new club Nintendo account gives me another free title for her! Bargain. @RD74 Your code will be available if you go to your account now. Mine was there pretty much straight away but no emai received. Looks pretty tempting. I already own Luigi's Mansion 2 and I'm hoping to get Animal Crossing when it comes out. Might go ahead and pick up either Fire Emblem or Pokemon Mystery dungeon then and get the one I didn't pick free. I'm lucky there's exactly four games in the line up that interest me a lot. @Peach64 I think this is moreso them trying to push online and the eShop then trying to push the games. I'm sure they know those games would sell anyway....but they're aim is probably to put consumers attention to the eShop and downloading retail titles. Wasn't there a report recently that said Europe's 3DS connection rate to the internet was the lowest of all regions? still waiting for my so many games promotion code for animal crossing...................Can anyone tell me how long after a game has been released does the code get sent out? @SPUD - Yea, I'm waiting for an AC code as well. @SPUD Check your Nintendo Club account, my code for AC was shown there even though I still haven't received it by email. Over two days and haven't got a code yet by email, but if you login to the website it will be displayed at the top of the page as one of the revolving news articles.